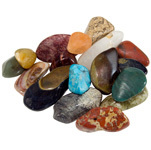 These polished and tumbled stones come with a wide array of exotic hues. 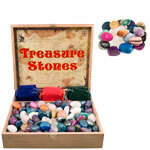 From warm yellows, golds and reds to cooler blues and purples plus some beautifully textured blacks and whites. 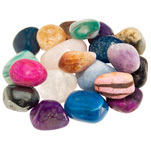 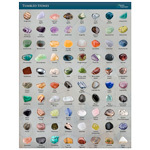 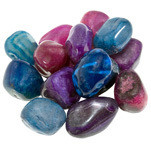 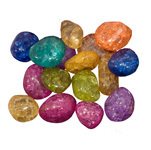 This mix is a popular choice for those who prefer to offer all naturally coloured stones (contains no dyed stones). India mix includes: Assorted jaspers and agates, bloodstone, moonstone, carnelian, amethyst, clear quartz, green aventurine and calligraphy stone. 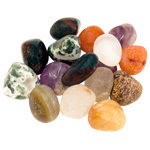 This mix is ideal for filling our Treasure Box, Treasure Chest, Pebble Patch or Rock and Mineral Discovery Centre. 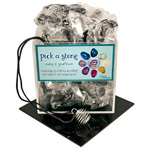 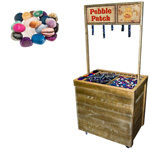 Use on its own, especially with our jewellery cage keychains and pendants, or combine with other stone mixes to suit the desires of your target customers.